Alright, so here's the deal. There's a lot of different groups in the EUS. Navigating the entire map will take some time, but this page is intended to help make it a little bit easier. I'll be doing a breakdown section by section of how these groups interact with a brief overview of what their purpose is. These are the head honchos running the show on the day to day. Elected by the constituents (with the exception of the VP Finance, who is selcomm'd),executives oversee a majority of EUS committees, funds, and overall operations. Their purpose is to hold committees accountable, to liaise with the various external parties relevant to the respective portfolios, and to keep the ship afloat. Each exec's individual responsibilities vary, and are outlined briefly in the EUS Constitution. Executives are to be held accountable by the Board of Governors, General Assembly, and EUS Council; all of whom may assign additional mandates or reverse decisions made by the Executive Committee. EUS Council is a forum for discussing matters pertaining to the EUS and assigning action accordingly. All relevant parties across the EUS are represented at council, empowered to voice their respective constituents' interests & inclinations. Council is responsible for enacting tangible improvements to the regular members of the EUS, holding SSMU Reps/Eng Senator/Execs accountable, enacting Policies&Resolutions to be carried out, and creating any various Committees to further attain a better society. EUS Council is adjacent in responsibility to the Board of Governors, who's role is more administrative and legal in nature. EUS Council is held responsible by General Assembly exclusively. A General Assembly is a forum called to represent all engineering undergraduate students. It may be initiated by a Motion at EUS Council or by 100 Regular Members of the EUS. The purpose of a General Assembly is to act as a forum for all engineering students to ratify amendments to Bylaws or create Bylaws (with the approval of the BoG), alter the financial structure of the EUS, and assign resolutions mandating EUS Council, the BoG, or the Executive Committee. The Board of Governors can overturn decisions made by the Executives, and is held accountable by a General Assembly. The Board of Governor's role can only be amended with ratification by the EUS Council. 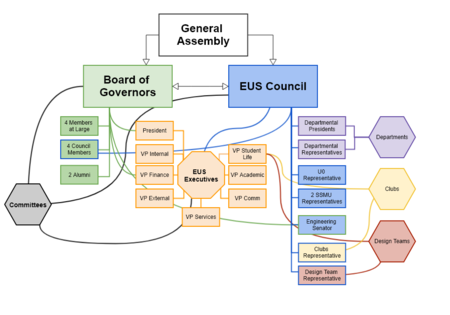 Departmental representatives comprise approximately 75% of EUS council members, and are otherwise largely distinct organizations. Each department may create it's own subcommittees, subclubs, events, and more without needing EUS Council's approval. Although different in purpose, Clubs & Design Teams are structured the same with respect to the EUS. They are groups with their own dedicated mandate, leadership structure, and goals. Both report to the VP Student Life, and are represented in EUS Council by their respective representative. Clubs & Design Teams are different than committees in the sense that they are independent groups who do not need to align with the Executive Committee's goals for example, or achieve a specific purpose for the students besides its own mandate. A committee is a group whose purpose is to support the EUS' mandate to its students; that may take many forms, be it the facilitation of fund distribution, event organizing committees, services, and more. When in doubt; it's probably a committee (The Plumber's Faucet is a committee, for example!). The Students' Society of McGill University is a body dedicated to representing all 23,000+ undergraduate students on the downtown campus of McGill University. Our Engineering/SSMU Reps (depending on which side of the table you're on) represent all engineering undergraduate students on SSMU Legislative Council, where policies & motions regarding undergraduate life are passed. That structure.... well, good luck trying to understand the SSMU Club Map. All you need to know is we are represented by SSMU, but the EUS as an organization does not need to align with SSMU's decisions. There are a number of positions who interact with the levels of administration at mcgill (e.g. MESC, the Engineering Faculty, McGill's Board of Directors, the Engineering Dean, and so on), most notably the EUS Senator, VP Academic, and President. An explicit rundown of the EUS' agreement with McGill is outline in the Memorandum of Agreement, a documents whose purpose is to draw exactly that line between us. This page was last edited on 21 February 2018, at 22:01.